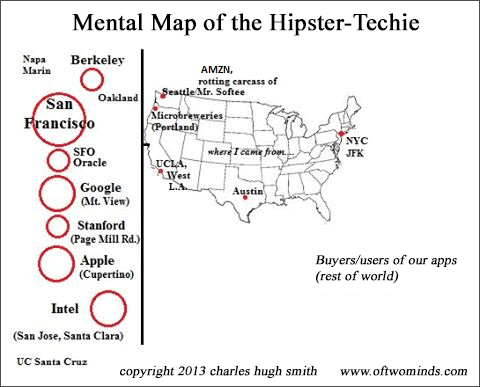 The influx of mobile/software tech into the S.F. Bay Area has triggered not just a boom in tech but in all the service sectors that cater to well-paid techies. This mass of new people has created traffic jams that last virtually all day and evening and overloaded the area's BART transit rail system such that trains at 11 pm are as jammed as any during rush hour. You may also like Has the Tech Bubble Finally Burst? We know how every boom ends—in an equally violent bust. Yet in the euphoria of the boom, it's easy to think this one will last longer than the others. I distinctly recall the mass excitement of COMDEX in 1999, the big computer-tech trade show in Las Vegas. The city was packed, the convention centers were packed, and an enormous banner announcing the then revolutionary slogan "the network is the computer—Sun Microsystems" welcomed the faithful. I saw Bluetooth demonstrated for the first time in that show (at a Motorola booth), and dozens of other consumer technologies that never quite caught on—kits to turn your PC into a TV, etc.